I remember the 3:00pm slump being the biggest challenge of the 9-to-5 work day. Energy is low. I’ll have been working for more than half the day, but, with plenty of work still to do before the whistle blows, I won’t seem very close to going home. No matter what my productivity had been like, no matter how much I jostled between various pressing needs and priorities, at that very moment only one thing is on my mind: I must take a nap. But sadly, a nap isn’t an option, at least it wasn’t for me. The next best is a snack and some fresh air. But during your quick walk around the block, be careful not to succumb to one of the more lucrative snack traps, which is a candy bar or some kind of pastry that will weigh you down and put you back in the mood for nap time. 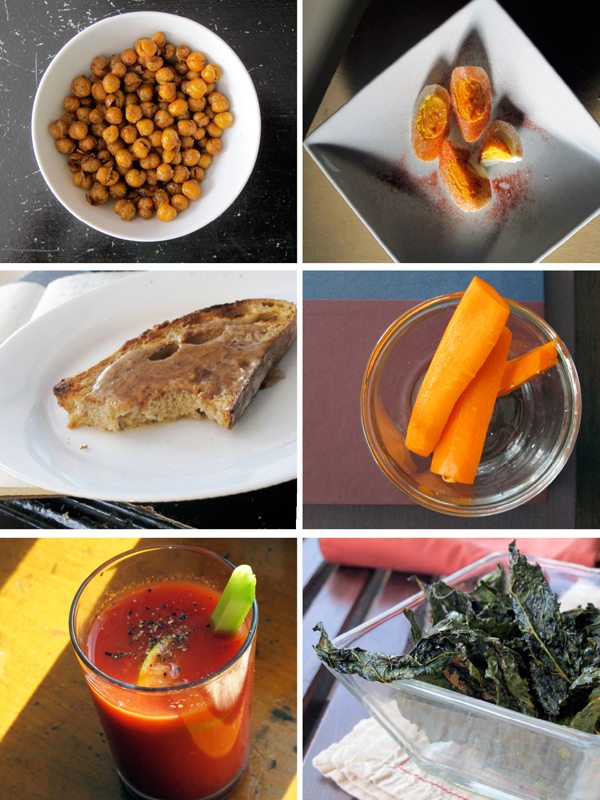 I was thrilled to recently be asked for some good afternoon snack recommendations. I’ve given snacks a lot of thought over the years. 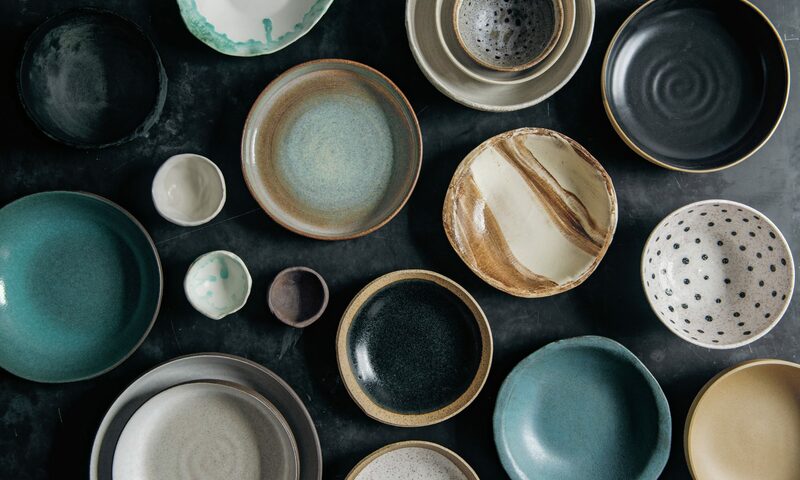 Figuring out how to satisfy the craving in a way that gets the balance right—fills you up but doesn’t weigh you down, and, most importantly, tastes really good—is a game that’s fun to win. Nowadays I work mostly at home, so I have the benefit of unfettered access to my kitchen and all its amenities. But when I worked daily at an office, I learned that there’s no shame, and nothing to lose, in asking that your office get, say, a toaster oven for the kitchen. So here’s a dozen of my favorite snacks. Some may seem more obvious than others. Most are meant to be packed up and taken with you to work. You’ll see that I skew toward snacks that aim to provide some energy via “whole” foods (ie, not processed too much), and that pack a bit of flavor. And while I do have a major sweet tooth, I only indulge it once below, and at the end. But this list is by no means comprehensive. I hope you’ll hit the comments with all the great snacks that I’ve overlooked or not thought of yet. 1. 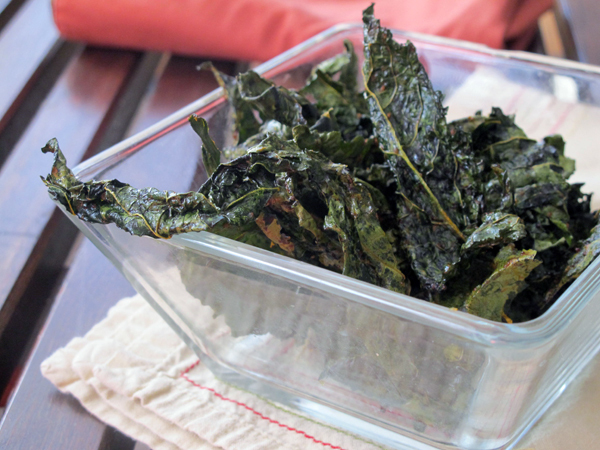 These Spicy Kale Chips are a slight variation on the standard method: Preheat the oven to 300°. Clean 1 bunch of kale, dry thoroughly, and carefully cut out the center rib. I prefer leaving the leaves intact rather than cutting them into small pieces, since they have a tendency to crumble later anyway. Whisk together about a tablespoon of oil, 1 teaspoon harissa, and a few pinches of salt in a mixing bowl, then using your hands, add the kale and toss to coat. Spread out on a baking sheet and bake for 15 to 25 minutes, stirring the pan once or twice, until crisp. Cool, then store in a sturdy airtight container (not a plastic bag—you’ll end up with kale chip dust). 2. Popcorn. Cheapest, easiest, most lightweight. I drizzle mine with olive oil and sprinkle it with some kind of seasoned salt—right now it’s the salt blend in this recipe, but in the past it’s been cumin salt, or curry salt, or just salt and pepper, or red pepper flakes, or whatever dry herb blend I have lying around plus salt. You can omit the salt, too! Why not? 3. Toast is my go-to snack. I eat it in the afternoon with olive oil or butter; with almond butter and apple jelly; with a smear of grainy mustard and a piece of sharp cheese; or a pillowy spread of ricotta, a drizzle of honey, sprinkle of flaky salt. 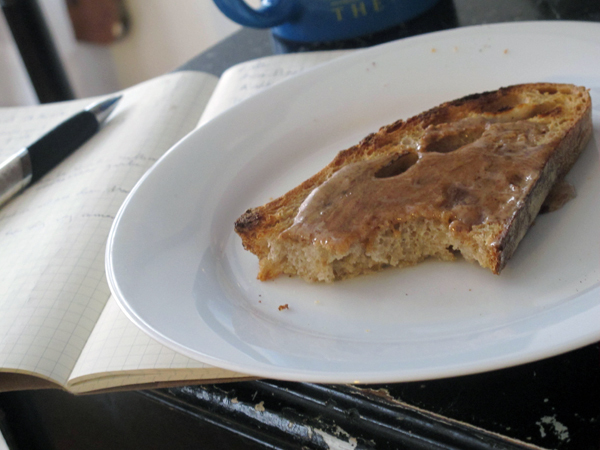 And sometimes I eat toast completely unadorned. 4. Dips with Crudites. There can be something ceremonious about dips in the afternoon, sort of like tea time. 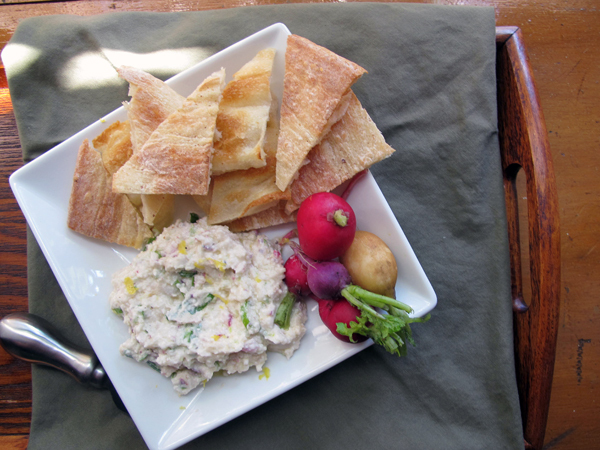 I still enjoy my Feta and Radish Dip a lot, even if it may have struck readers here as strange—I use it for (freshly toasted) pita triangles, rice crackers, or carrot or celery sticks. I also especially love this vegan spread called Faux Gras, available in the New York City area (and by shipment if you write to The Regal Vegan directly). It’s a perfect blend of lentils, toasted walnuts, caramelized onions, miso, and some other stuff—so remarkably delicious you won’t think twice about the potentially confusing name. And then there’s hummus, nut butters, tzatziki, white bean dip, all of which are very simple to make at home or buy at the grocery store. 6. A Hard-Boiled Egg is another snack I rely heavily on. Most of the time, I quarter it lengthwise and sprinkle with a little salt and smoked paprika. To hard-boil eggs, cover eggs with cold water in a small saucepan. Place over high heat. When the water comes to a rolling boil, put a lid on the pan, remove it from the heat, and let stand for 11 minutes. 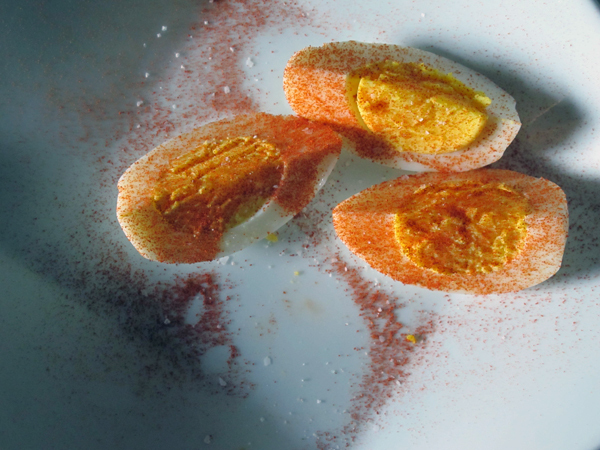 Immediately transfer the eggs to an ice bath until completely cooled. I find that letting them sit in the cold water for 15 to 20 minutes, or more, makes them easier to peel. 7. Yogurt is probably a no-brainer, but a heaping spoonful of good plain yogurt over a diced up crisp apple, dusted with a bit of cinnamon, allspice, and/or nutmeg is a satisfying and successful way to appease my sweet tooth. 8. 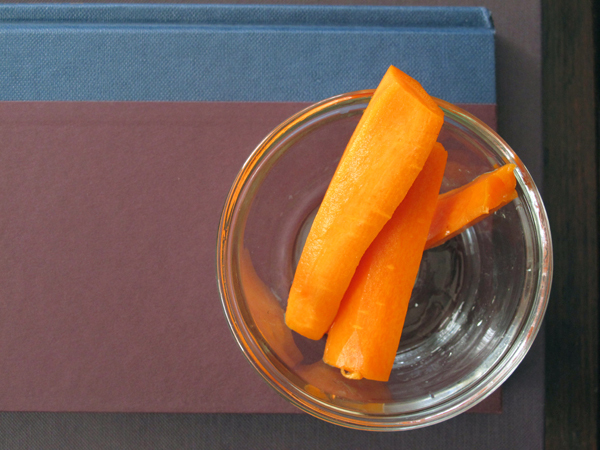 Pickled Carrots are for when you need a bright and salty pick-me-up. I recently learned this method, which requires some advance planning, from Hiroko Shimbo’s excellent book The Japanese Kitchen. Chop 2 medium to large carrots, peeled if desired, in half, and then cut each piece into lengthwise quarters to make carrot sticks. Toss with 1-1/2 teaspoons Kosher salt, then arrange in a single layer on on a wide, rimmed plate. Now place a second plate on top of the carrots and balance some kind of weight—a few canned goods, or a large liquid measuring cup filled with water—on top of the top plate to weigh the carrots down. This will soften and flavor the carrots, as well as extract moisture. Let stand for about 3 hours at room temperature. Remove the carrots from the extracted liquid (discard the liquid), then place them in a a big resealable plastic bag. Whisk together 1/4 cup mirin, 1/4 cup unseasoned rice vinegar, and 1 tablespoon sugar until the sugar is dissoved, and pour this liquid over the carrots. Seal up the bag, squeezing out as much air as possible without making a mess, and store in the refrigerator overnight. Give the bag a gentle shake periodically to redistribute the liquid. These will keep for 3 or 4 days, stored in the vinegary liquid. 9. 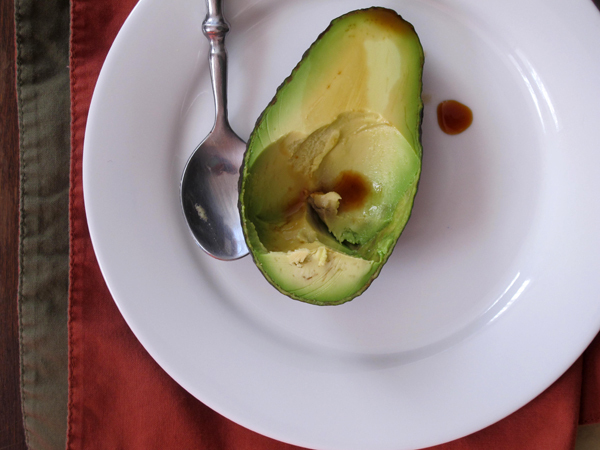 I’ve loved Avocados for my whole life, and they’ve always been a reliable snack. I like to eat them plain, one half at a time, with a spoon, right out of the shell. But they’re also good with a spritz of lemon juice and coarse black pepper, or a drizzle of dark soy sauce. 10. Edamame Salad. I used to seek out the edamame salad from the Whole Foods salad bar, the one with the sesame oil and sesame seeds and, if I remember correctly, little strips of nori. Just a few bites packs a good dose of protein and some satisfying savoriness. When I make it at home, it’s usually very improvisational but it goes something like this: Cook a package of frozen edamame beans according to the package instructions and then shock in ice water. Drain. Whisk together 1 tablespoon light olive oil or other neutral oil, 1 teaspoon toasted sesame oil, 2 teaspoons brown rice vinegar, 1-1/2 teaspoons dark soy sauce, a pinch of salt, and a pinch of sugar. Taste the dressing and adjust if necessary, then toss with the edamame. Add a tablespoon or two of toasted white or black sesame seeds. Add any other adornments you like: a finely minced shallot; a handful of minced chives; a pinch of freshly grated ginger; little strips of nori; a chopped up apple, diced cucumber, or thin slices of radish. This will keep for a few days in an airtight container. 11. Tomato Juice. A few years ago, at a previous job, I worked on a book in which the author references a V8 diet: her doctor instructs her to drink V8 exclusively, to carry it around in her purse and crack one open whenever she gets hungry, promising that the pounds will melt off. I have no idea why it appealed to me—I wasn’t looking to go on a diet, and usually this kind of thing strikes me as silly—but it did. Tomato juice and other vegetable juice blends—it obviously doesn’t necessarily have to specifically be the V8 brand, there are some good organic brands out there—are filling and easy to have on hand. (But watch out for salt levels, if that’s a concern.) If you’re interested in fussing it up, I like mine bloody mary style, with a wedge of lime, a few dashes of hot sauce, and maybe a celery stick. 12. And finally, if you need something sweet: Bittersweet Chocolate with a Few Drops of Good Balsamic Vinegar on It—it may or may not surprise you that I learned this one at the Fancy Food Show—is surefire way to bring a little class to your desk. These Peanut Butter Cookies are a hit at my apartment, and quick; I’ve been able to throw the dough together in the window of time between getting dinner into the oven and out on the table. And if you need a little square of a really indulgent brownie, these Cocoa Brownies with Browned Butter and Walnuts will fit the bill. So many of these are favorites of mine. 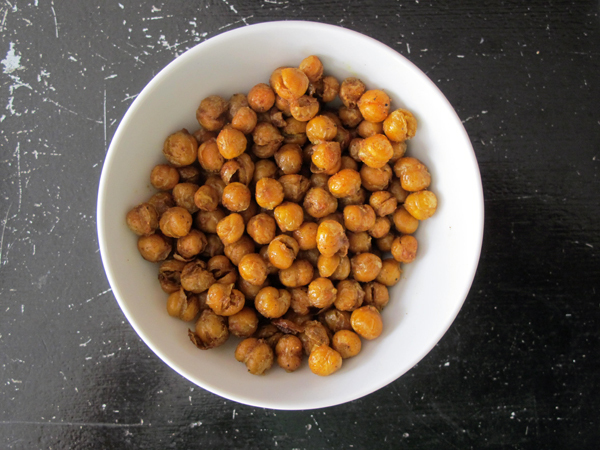 I am loving roasted chickpeas right now, too, so much that I tried roasting black eyed peas. They were good, but not as good as the chickpeas. I eat avocados constantly- I love them with garlic salt, and believe I have them to thank for my twin boys being born so healthy- I ate an avocado almost every day during pregnancy. Thank you for sharing these healthy snack ideas. I look forward to trying your edamame salad- that looks amazing and I think it deserves it’s own post. Ohhh, some new things to try, and some reminders of old simple favorites! Thanks, this is timely as I am eating every few hours and small nutritious “snacks” work best…..and a bonus if portable!! All have been amazing. I can’t wait to try more combinations! All good suggestions, this will really help improve my snacking habits. Those all sound terrific! Thank so much!